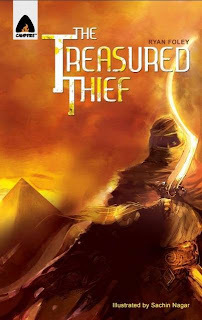 I stumbled across Ryan Foley's and Sachin Nagar's book The Treasured Thief the other day. I'd never heard of it, but a quick flip-through suggested that it was pretty decent, so I figured I'd give it a shot. 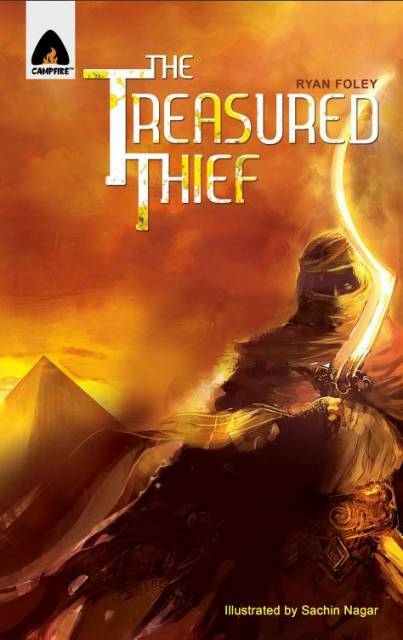 The main story is about an ancient pharaoh who hires a master architect to create an impenetrable vault to hold his treasure. However, it turns out this architect owes some shady "we'll sell your daughters into slavery" people a good amount of debt, and they're quite impatient to collect. To no great surprise, the architect built in a secret entrance to this vault, and told his sons about it so they might fetch just enough to pay off these bad guys. Also, not unsurprisingly, "we'll just take what we need" becomes something of an ongoing thing, and eventually the pharaoh eventually realizes that he's being looted. So the book becomes something of a game of one-upmanship as the pharaoh lays traps which the youngest son has to continue to elude. As the story progresses, each displays increasing amounts of guile and cunning, providing for some interesting (and unexpected) twists in the story. The art is pretty smooth throughout. The story is paced well, and The action is always clearly defined. Despite a decent, and potentially confusing, cast of characters, Nagar is able to make everyone distintive even when they change outfits or are in disguise. We don't need to see the pharaoh in his honorary headgear in each and every appearance to know who he is. I am curious how accurate the costumes and architectural designs are; they seem pretty authentic, but I might be confusing museum trips with bad historical movies. The book is pretty clearly aimed at younger readers, but not in a way that is either condescending or enjoyable only to them. It really is an all ages book in the best sense of the phrase. I had never heard of Foley, Nagar, or even Campfire Books before I saw this, but given how well they did here, I will definitely be keeping my eyes open for other books from these folks. Some very solid and enjoyable stuff!